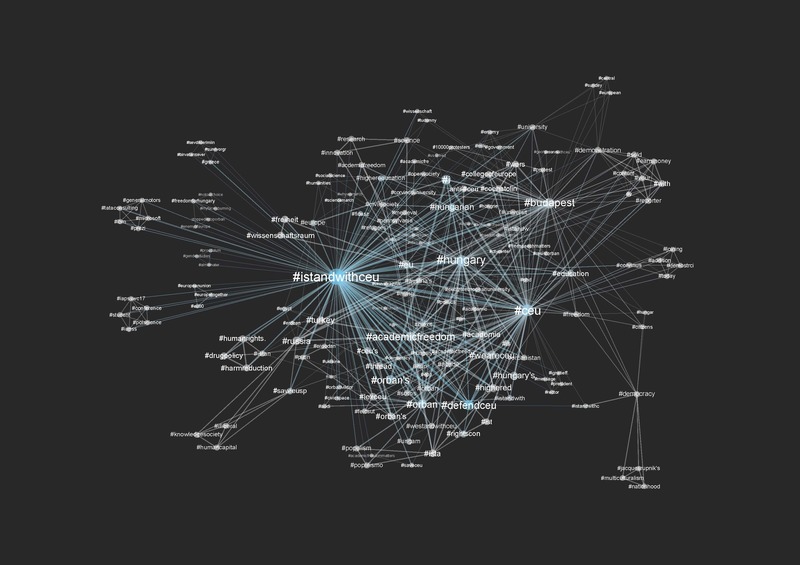 A map of the network of Tweets with the hashtag #IstandwithCEU shows public opinion feels the accusations are not just against CEU, but against academic freedom and higher education in Hungary as a whole, according to Milan Janosov, a doctoral student at CEU's Center for Network Science (CNS), and CNS Director Balazs Vedres. "We collected all the tweets containing the #IstandwithCEU hashtag, using the official Twitter API, since the #IstandwithCEU hashtag's first appearance," Janosov said in a blog post. "Academic freedom is the most significant node connected to #IstandwithCEU, and the topic is co-mentioned with other controversial issues, such as Brexit and the current events concerning higher education in Turkey and Russia." Based on the first 10,000 tweets with the tag, the researchers mapped a network of the most popular additional hashtags, also used in these tweets. On the visualization the size of each node (hashtag) is proportional to the number of tweets it appeared in, and the width of the edges represents the co-occurance frequency. Color encodes time, with blue tags being used the earliest, and grey tags entered the latest. See the CNS blog for more information.